Now this is what I call a Friday Find! 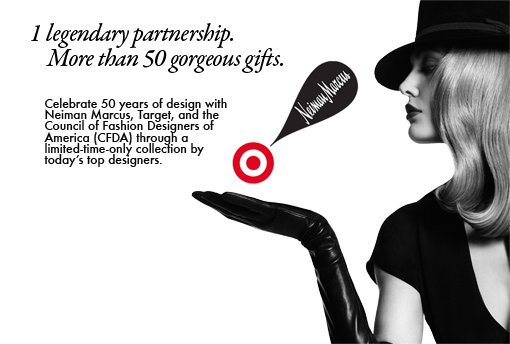 TARGET & NEIMAN MARCUS TEAM UP! Seriously, I haven't flipped, come this Christmas, December 1st to be exact, there will be an unparelled fashion collab the likes of which a fashionable working girl, (getting her bargain on), has never seen before. Target will have officially topped themselves. 24 coveted American Fashion Designers have signed on and both retailers will carry the same merchandise in all of their stores and on line with price points from $7.99 to $499 with most items under $60. This marketing strategy will not only get high end buyers to know Target better but Neiman Marcus is hoping to break their stodgy image. That store is so dead you could here a Chanel pin drop. The two companies are also jointly making a $1 million donation to the Council of Fashion Designers of America. Win win all around. As for us my pretty little shoppers here's the amazing list of designers who have signed on to make pieces that we will be able to get our polished little hands on at some very budget friendly prices. Alice + Olivia . Altuzarra . Band of Outsiders . Brian Atwood . Carolina Herrera . Derek Lam . Dian von Furstenberg . Eddie Borgo . Jason Wu . Judith Leiber . Lela Rose . Marchesa . Marc Jacobs . Oscar de la renta . Philip Crangi . Prabal Gurung . Proenza Schouler . Rag & Bone . Robert Rodriguez . Rodarte . Skaist-Taylor . Thom Browne . Tory Burch . Tracy Reese . And as if seeing the Target logo merged with the Neiman Marcus logo wasn't enough, they merged it with the Tory Burch logo, be still my heart! Getting your bargain on never looked so good!